cool music and things: Signing off from HMV Peterborough 246. Hi. Meg here. If you don’t already follow me or this blog online - all you really need to know is I’m a big music fan and generally a bit of a nerd. 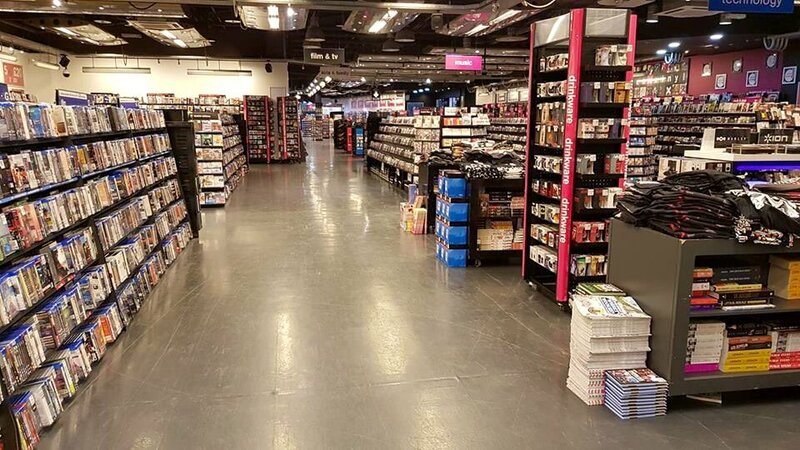 As such, HMV has been my favourite store for as long as I can remember. I discovered and explored a lot of my current musical loves through it. Last week was simultaneously one of the best and worst weeks of my life. I lost my job on Tuesday. First, the good: I absolutely adore live music and on Wednesday evening I somehow managed to see Mumford & Sons play an acoustic set to 150 people in a pub in North London. It was last minute and an incredibly well timed piece of live music therapy. A couple of days later, Friday brought what I’m sure will be one of my gigs of the year in the shape of The Vaccines at The Roundhouse. Both nights were brilliant. The bad: these incredible gigs have been massively overshadowed by some of the worst news I’ve had to hear in recent years. I’ve worked for my local HMV store in Peterborough since September 2017, during which time I’ve met some of the most wonderful, knowledgeable and crazy colleagues. We’re like a little family and I love them. I have loved this company - particularly my local store - and admired its staff for many years and getting the job was genuinely a bit of a dream come true. I’d been applying to other stores in the area for a few weeks after graduating and was making very little progress when suddenly HMV were hiring - commence frantic application writing! The interview with my soon to be manager turned from a scheduled fifteen minutes to us losing track of time and discussing our favourite musicians and actors for an hour and I could already tell I would love it there if the rest of the staff were this lovely. And they were. The past year and a half have been great. I love my job. The people I work with are wonderful. I’ve never been particularly confident or outgoing but my time at HMV has really helped with that. I’ve found that it’s easy to build a rapport with customers when they’re passionate about something. Even if it’s not something I’m a fan of personally I love seeing customers react to finding products that relate to something they love and expressing their fandom. Most recently there have been lots and lots of BTS fans in our shop! I bought my first 12” album (Modern Vampires Of The City by Vampire Weekend) from the store back in 2013 when the vinyl section was about an eighth of the size it is now. I fondly remember dragging friends into the store to browse through all of the vinyl every time I was in town. 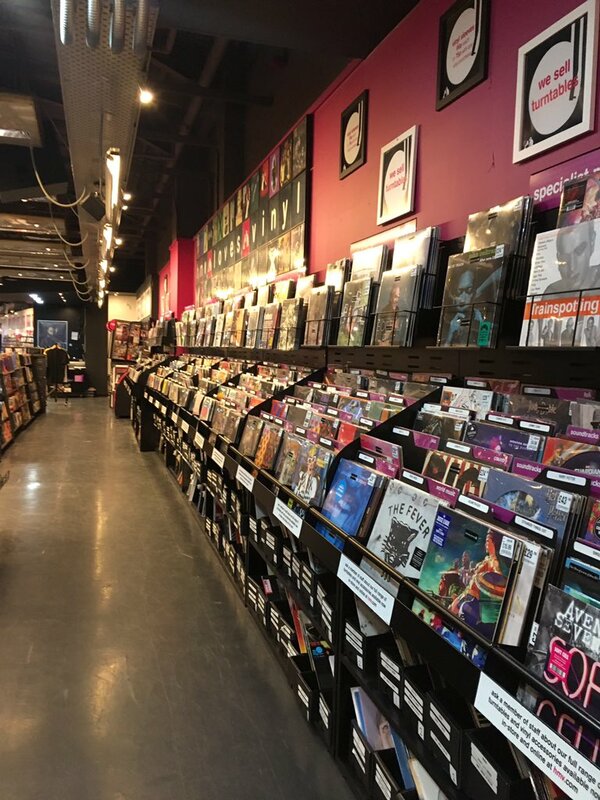 I’ve been looking after the vinyl department for several months now and genuinely love seeing customers browse it, hunting for their favourite bands or for something new to listen to. Granted, Spotify has its bonuses, but it doesn’t give you the same impact of a 12” album sleeve and the buzz a great album cover can give you in the physical form. There’s something very special about vinyl and it felt great to be in some way on the forefront of its revival, seeing a really wide range of customers collecting it. I love that department. A couple of days after Christmas, the company announced they were calling in the administrators for the second time in six years. I heard the news through messages from friends and family. What followed was a stressful and uncertain month for us all. My colleagues and I mostly received immense support from our loyal customers, but also had to shield almost constant questions from customers hoping for a closing down sale, and the anger of customers who weren’t pleased about our amended returns policy and other matters that were entirely out of our hands. All this while we were worrying about the security of our jobs. I’ve spent a month telling customers that as far as I knew at the time, the store wasn’t closing down and that we were hopeful it would be saved. I’d be lying if I said I didn’t feel like I’d almost let them down. Last Tuesday I awoke to the news that the company had been bought out by Doug Putman, a Canadian businessman and self-professed vinyl nerd who runs Canada’s Sunrise Records. Amazing news. I was quickly told that not all stores were part of the deal. My colleagues were informed, via a conference call at 9am, that our store hadn’t been saved and was to close immediately. That was it. Suddenly 14 of us were jobless, the store was closed and we couldn’t even tell those customers who are in the store every single day. The regulars. It was my day off and time suddenly got a bit blurred (and has stayed that way since… I don’t think I’m alone in losing track of what day or time it is several times this week.) A couple of hours had passed as I sat scrolling through Twitter, chatting to colleagues and trying and failing to register what had just happened. I broke the news to a couple of friends that they’d lost their job. And I cried, a lot. Have I said that I really love my job?! I took a bus into town - everything seemed strangely normal. The news hadn’t broke locally that our store was closing yet. I headed to the store to rescue the belongings from my locker (you can take my job - but not my TARDIS mug.) We were asked to leave the store, and shoppers stared as we emerged from the shutters. It was incredibly surreal. My colleagues and I headed to the pub to gather our thoughts. It felt like somebody had died. The hours flew by, and after saying an emotional goodbye I headed home, and cried the whole way. What was I supposed to do now? I hadn’t intended to be at the store for the long term - I have dreams of finding my way into the music industry and perhaps this is my opportunity to get out there, but…. have I said I really love my job?! I live at home and thankfully, losing my job doesn’t put me in too terrible a financial position, I can take my time to find something new. But I’m lucky. I have colleagues who live in their own place and have rent or mortgages to find the money for, children to provide for - and I can not comprehend how much stress they must be feeling. Some of my colleagues have been working for the company for almost as long as I’ve been alive - I cannot for a second comprehend how it must feel to have that taken away from you suddenly, and to all of a sudden need to consider the prospect of a job interview for the first time in two decades. None of my colleagues deserve this. They’re wonderful people and I hate that this is happening to us. It’s been a bit of a rollercoaster week. A trip to the centre on Friday and seeing our wonderful shop - with the stock still in it - submerged in darkness with the shutters down was a bit hard to bear. Sitting down to update my CV on Thursday essentially started and ended with me adding an end date to my employment with HMV. Genuinely heartbreaking. I’ve been in touch with my colleagues, hearing how they can’t sleep or eat, how this is affecting their families. It hurts to know how they’re all feeling and to feel so helpless. It’s taken me a few days to gather my thoughts, but I really wanted to share something here about the situation and my wonderful colleagues at HMV 246. I genuinely believe that the closure of our store is a great loss for the city - I recently saw an article about Peterborough vying for the title of ‘City of Culture’ in 2020. For me, particularly having spent a few years living and studying in the beautiful city of Oxford - I consider music as a hugely important part of culture, and what good is a city with no record store in its centre? All hope may not entirely be lost… an article was published in The Guardian a couple of days ago, including quotes from the new owner of HMV. It stated that he was “in talks with landlords on the rest of the 27 outlets which closed down earlier this week” and was “relishing the fight to save all the stores”. The historic (and original) Fopp store in Glasgow’s West End was re-opened on Saturday after members of the public and bands such as Mogwai created an online campaign to show their love for the store. I can’t pretend to understand exactly why our store closed but I do understand that word of mouth, and social media buzz can clearly make all the difference - and spreading the love for our wonderful store can surely do no harm at this point! We’ve set up a group on Facebook here to spread the word and show the love there is for the store locally. We’re also tweeting with the hashtag #SaveHMVPeterborough & have already had support from the likes of Neil Gaiman (!! ), The Hoosiers, 88 Films, Transgressive Records, Gengahr & Cassidy Little. Any help you can give would mean the world. If you have time to get in touch with Sunrise Records & HMV via email too that would be incredible. Perhaps its also remembering a bit more history of the store. Back in the days of HMV being outside where Nandos now is I believe, the current queensgate location was previously Zavvi which then merged with HMV. Zavvi had taken the UK arm of Virgin megastores - which the queensgate store also once was if I remember correctly. Zavvi itself had collapsed when woolworths collapsed due to the discruption the woolworths collapse caused to the supply chain. Going back further, I remember back to when Peterborough had not only HMV and Virgin, but also an Our Price (where yankie candles now is I think?) and an Andys Records on bridge street. Plus Woolworths and WHSmiths all selling Videos/music. Its crazy that even in todays world of the resurgence of vinyl that we can't support a single Music store anymore. Sorry to hear you lost your job but good luck with finding work in music, I am sure you will get there. If you still want to buy vinyl in Peterborough look up Marrs Plectrum records, its the smallest record shop in the UK but run by one of the nicest people out there. Takes part in RSD every year and has a great selection of genres, new and second hand.